Welcome to the iSchool’s virtual convocation website, where we celebrate our 2016–2017 academic year graduates! We encourage you to peruse the site, taking a moment to read the convocation speakers’ messages, play the audio degree presentations, and post congratulatory messages on the graduate profiles. You’re also invited to join us for the live celebration on Saturday, May 20, 2017, from 11 a.m. to noon Pacific Daylight Time. The convocation ceremony will be held online, so friends and family, near and far, can attend the momentous event. If you’re looking for that perfect iSchool memento, check out our store on Zazzle. All purchases help fund our student scholarship program. 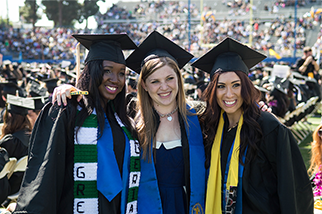 Don’t forget to use #SJSUiSchool2017 for all your social media posts. To watch video of our 2017 convocation speakers, please visit the Convocation Speakers section of the site. Also, please watch the Student Celebration.